Deputy Attorney General Rod Rosenstein testifies on Capitol Hill in Washington, June 13, 2017, before a Senate Appropriations subcommittee hearing on the Justice Department's fiscal 2018 budget. 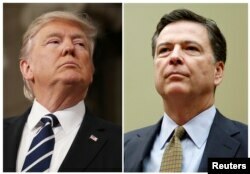 A top U.S. Justice Department official assured lawmakers Tuesday that without "good cause" he would ignore any attempt by President Donald Trump to fire a special counsel investigating possible illegal collusion between Trump's aides and Russian officials in last year's campaign. Deputy Attorney General Rod Rosenstein, who appointed Robert Mueller, a former director of the Federal Bureau of Investigation, to lead the high-profile investigation of Russian meddling in the election aimed at helping Trump win, told a Senate panel he would not comply with any Trump order to fire Mueller absent a compelling reason. He added that no such reason currently exists. Rosenstein offered his assurances as U.S. news accounts quoted Republican allies of Trump suggesting that the president is considering firing Mueller, whose appointment last month drew widespread praise from both Republicans and opposition Democrats. Now, however, some Republicans are suggesting that Mueller ought to be dismissed, pointing to Mueller's selection of key investigators who made campaign donations to Trump's Democratic challenger, former U.S. Secretary of State Hillary Clinton. A key Trump supporter, former House of Representatives Speaker Newt Gingrich, said, "Republicans are delusional if they think the special counsel is going to be fair." Rosenstein said he was the only Justice Department official who could dismiss Mueller because Attorney General Jeff Sessions recused himself from oversight of the Russian investigation because of his staunch support of Trump during the campaign and later revelations that he had met twice with Russia's ambassador to Washington. "As long as I'm in this position, he's not going to be fired without good cause," Rosenstein said. "I’m not going to follow any orders unless I believe they are lawful” and that "it wouldn't matter what anybody said." Democratic Senator Dianne Feinstein of California told Rosenstein, "It would be catastrophic," if Trump fired Mueller. "I appointed him and I believe it was the right decision and I'm going to stand by that," Rosenstein said. Rosenstein's testimony before the Senate Appropriations Committee occurred just hours before Sessions was to testify in a public hearing before another Senate panel about his contacts with Russian Ambassador Sergey Kislyak and his involvement in the firing of another FBI chief, James Comey. During his confirmation hearing in January, Sessions said he had not met with any Russians during the campaign. The Justice Department later acknowledged Sessions's contacts with Kislyak but said they were part of Sessions's job at the time as a senator. His testimony comes less than a week after Comey said during his own appearance before the Senate Intelligence Committee that he felt Trump had violated the normal separation of criminal investigations from White House oversight by urging him to end the investigation into Russia's activities. Comey said Trump told him he hoped Comey would "let go" of his investigation of the president's first national security adviser, Michael Flynn, and also asked Comey to pledge his personal loyalty and to "lift the cloud" of the Russia probe. Was Comey conversation taped ? The White House again Monday refused to say one way or the other whether there was a tape. Republican lawmakers are urging the Trump administration to release the recordings, if they exist. Trump fired Comey last month. Trump later said he was thinking about "this Russia thing" as he decided to dismiss him because he considered claims that Russian interference in the election influenced it in his favor to be bogus, an excuse by Democrats to account for his stunning upset of Clinton.